Isabelle Buard, Christine S Martin, Benzi M Kluger M.D., M.S. Background: Dementia is the leading cause of nursing home placement in Parkinson's disease (PD), yet little is known about the causes of cognitive dysfunction in PD and there are no effective treatments. Our preliminary data and other published studies suggest that abnormalities in brain activity involving networks important for normal thinking and memory may contribute to cognitive dysfunction in PD and may represent a target for treatment. 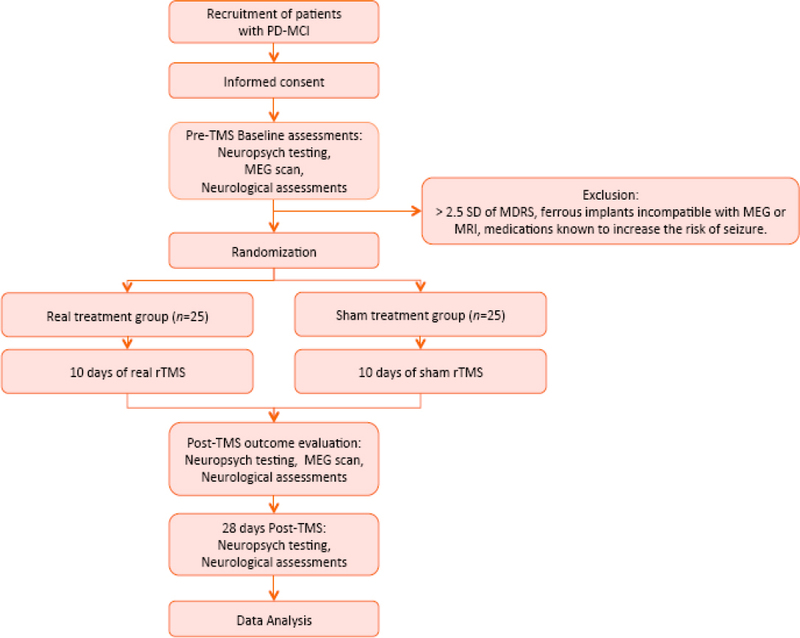 Methods/Design: A randomized control trial will be conducted to assess the therapeutic potential of bifrontal repetitive transcranial magnetic stimulation (rTMS) in modulating cortical activity related to cognitive dysfunction in PD. This study will be performed at the University of Colorado Denver, Anschutz Campus, in Aurora, Colorado. Fifty-five PD patients (> 40 years of age) with mild cognitive impairment or mild dementia will be included and randomized in a 1:1 ratio to sham or real rTMS groups. Primary outcome measurement is the total score of the Mattis Dementia Rating Scale. Secondary outcome measurements are domain specific ratings of executive function, memory, language, attention, and visuospatial abilities. Discussion: If bifrontal rTMS results in positive changes to cognitive function in PD patients with mild cognitive impairment, this may represent a new and effective treatment for PD-related cognitive dysfunction. Secondly, evaluation of any bifrontal rTMS-induced changes to cognitive function will improve the current understanding of the mechanisms behind the causes of cognitive dysfunction in PD. Trial registration: Clinical Trials.gov identifier: NCT02346708; registered on 9 January 2015. Ethics: This study protocol was approved by the Colorado Multiple Institutional Review Board (COMIRB) (approval No. 13-2474) and will be performed in accordance with the Declaration of Helsinki. Parkinson's disease (PD) affects 1-2% of people aged 65 and over, representing over 1 million Americans (Dorsey et al., 2007). Although traditionally characterized by motor symptoms, over the course of PD cognitive symptoms have a greater impact on patient suffering and caregiver burden (Docherty and Burn, 2010). Three-fourths of patients surviving 20 years or longer develop dementia making it the leading cause of nursing home placement (Hely et al., 2008). Despite the high prevalence of cognitive dysfunction in PD, its pathophysiology is poorly understood and current treatments have minimal effects on symptoms or progression (Emre et al., 2004). Moreover, standard medical and surgical PD treatments have no effect on cognition and may in fact worsen cognition (Kluger et al., 2011). Better treatment strategies for PD-related cognitive dysfunction based on an improved knowledge of neurobiological mechanisms are clearly needed. Functional connections between cortical regions are important for normal cognition and memory (Friederici, 2011; He et al., 2012) and alterations in functional cortical connectivity may contribute to cognitive dysfunction in PD (Bosboom et al., 2009). In the past decade, modern network theory has emerged as a powerful tool to describe the organization of functional brain networks using the mathematics of graph theory (Stam and van Straaten, 2012). Two fundamental measures are path length, defined as the average distance between any two nodes in a network and a measure of global efficiency and integration; and the clustering coefficient, defined as the average number of mutually connected nodes surrounding each node and a measure of local efficiency and modularity. An optimal balance between global and local efficiency can be achieved through clustered modules connected through integrating links, a design termed small-world architecture (Wylie et al., 2012). It is well-established that healthy brain networks demonstrate small-world architecture (Rubinov and Sporns, 2010). Importantly, loss of small world features is associated with cognitive dysfunction in multiple sclerosis and Alzheimer's disease (AD) (Sanz-Arigita et al., 2010; de Haan et al., 2012; Hardmeier et al., 2012). Known features of PD neurophysiology relevant to network connectivity include reduced cortical inhibition (Lefaucheur, 2005), which may lead to disrupted modularity, and pathological subcortical oscillations (Pogosyan et al., 2010), which may drive increased randomness. Our pilot data and other studies (Wu et al., 2009) suggest that network architecture is abnormal in PD, but its relationship to cognitive dysfunction has not been examined. Magnetoencephalography (MEG) measures cortical activity on a millisecond time scale and can provide highly informative data for graph theory analyses (de Haan et al., 2012; Hardmeier et al., 2012). Advantages of MEG versus fMRI include high temporal resolution, ability to separate oscillatory spectra and direct measurement of neuronal activity (Robinson et al., 2012). MEG has been used to examine the mechanisms of cognitive therapeutic agents in PD such as acetylcholinesterase inhibitors (de Haan et al., 2008). Repetitive transcranial magnetic stimulation (rTMS) modulates brain activity using repeated pulses from a magnetic coil over the scalp. rTMS may induce effects through changes in cortical excitability (Daskalakis et al., 2006), neuroplasticity (Chen and Udupa, 2009), gene expression (Aydin-Abidin et al., 2008), neurotrophic factors (Wang et al., 2011), and neurotransmitters including dopamine (Cho and Strafella, 2009). Recent studies further show that rTMS can modulate focal oscillatory activity (Barr et al., 2009) and network connectivity (Fox et al., 2012; Shafi et al., 2014). Our preliminary data suggest that rTMS similarly affects network connectivity in PD. The therapeutic potential of rTMS is established in certain neuropsychiatric illnesses, including Food and Drug Administration (FDA) approval for depression (Connolly et al., 2012). rTMS can also improve cognitive function in healthy older adults (Kim et al., 2012), Alzheimer's disease (AD) (Rabey et al., 2013), and PD (Boggio et al., 2005; Srovnalova et al., 2011). Limitations of prior PD studies include not specifically enrolling subjects with cognitive impairment, not controlling for depression, not assessing the durability of benefits and not tying rTMS effects to mechanisms. In this study we address these limitations in a clinical and mechanistic trial of rTMS in PD patients with mild cognitive impairment (MCI). rTMS can improve cognition in PD without dementia (Srovnalova et al., 2011), PD with depression (Boggio et al., 2005), older adults (Sole-Padulles et al., 2006) and in AD (Cotelli et al., 2008) but has not been tested in PD-MCI. Given the need for improved cognitive treatments and possible differences in rTMS effects on PD-MCI pathophysiology, it is important to specifically test rTMS in this population. Prior studies as well as our own pilot data suggest that rTMS modulates cortical connectivity (Fox et al., 2012; Shafi et al., 2014); thus rTMS provides not only a potentially effective intervention but an important causal test of the theoretical link between cortical connectivity and cognitive dysfunction in PD. Our clinical objective for this experiment is to determine whether rTMS improves cognitive outcomes in PD-MCI. Our mechanistic objective is to determine whether rTMS normalizes patterns of cortical connectivity using MEG. We hypothesize that high-frequency bifrontal rTMS will partially normalize patterns of cortical connectivity linked to frontal nodes and will improve cognitive measures. A randomized controlled clinical trial with two parallel arms will be designed. Fifty-five PD-MCI subjects will be randomized to a 10-day course of real or sham bifrontal high frequency rTMS. Subjects will be recorded at rest during the MEG scan. We will measure cognitive and MEG outcomes pre-treatment and on the day of the last treatment and repeat cognitive measures 28 days post rTMS to assess the durability of cognitive changes. The flow chart of this trial protocol is shown in [Figure 1]. PD: Parkinson's disease; MCI: mild cognitive impairment; rTMS: repetitive transcranial magnetic stimulation; SD: standard deviation; MDRS: Mattis Dementia Rating Scale; MEG: magnetoencephalography; MRI: magnetic resonance imaging. We will recruit 55 participants over the age of 40 from the Movement Disorders Center at University of Colorado Denver. PD subjects diagnosed with probable PD using UK Brain Bank Criteria (Hughes et al., 1992) and with MCI using the Movement Disorder Task Force 2012 criteria (Litvan et al., 2012) as well as a Clinical Dementia Rating scale score (CDR) less than 2 (Morris, 1993) will be enrolled in the study. All study visits will be performed in subjects' best dopaminergic "On" state. PD MCI and mild dementia subjects will be tested on anticholinesterase therapy, if already taking these medications given the potential difficulty of finding drug naïve subjects; long half-life of these medications; and desire to find measures robust to medication effects as seen in prior MEG studies (de Haan et al., 2008). Subjects are allowed to withdraw at any time, for any reason, and will not lose the any benefit or right as a result of withdrawal. Subjects may be withdrawn if the study doctor thinks that being in the study may cause the subject harm or for any other reasons. Subjects will be recruited from the University of Colorado Hospital (UCH) Movement Disorders and Neurobehavior clinics and Denver Health Medical Center Movement Disorder Clinics which see over 3,000 patients annually, 40% of whom have PD and 10% of whom have PD-MCI (approximately 300 patients per year). After enrollment and screening assessment, PD-MCI subjects will undergo neuropsychological testing, magnetoencephalography (MEG) recordings, and MRI. PD-MCI subjects will then be randomized in a 1:1 ratio into real or sham TMS groups using MAPLE 9.0 software (Waterloo, Canada). Subjects will also be counterbalanced by side of initial stimulation (left vs. right hemisphere). TMS will be administered using a 70-mm diameter air-cooled figure-of-8 Stimulator to the right and left dorsolateral prefrontal cortex (DLPFC; Brodman area 46). TMS will consist of 10 sessions (over two weeks) of 20 Hz repetitive TMS given at 90% resting motor threshold (RMT) for 25 trains of 30 pulses per train, inter-train interval of 30 seconds for a total of 750 pulses per hemisphere, which is well within the most recent international TMS safety guidelines (Rossi et al., 2009). This dose and duration of rTMS is based on physiological studies of healthy adults (Barr et al., 2009) and treatment studies of cognition in PD (Srovnalova et al., 2011) and AD (Cotelli et al., 2008). RMT will be determining as the lowest TMS intensity needed to produce a motor-evoked potential of at least 50 μV in 50% of the trials delivered. Sham stimulation will be delivered using a sham coil fitted with electrodes to mimic both the auditory and somatic sensation of real TMS (Triggs et al., 2010). Outcome measures will be assessed at baseline and post-intervention. Cognitive outcomes will also be assessed 28 days post-intervention ([Table 1]). Total score of the Mattis Dementia Rating Scale (MDRS) (Mattis, 2002), which measures multiple cognitive domains and is validated in PD (Llebaria et al., 2008). An important secondary question is whether connectivity in specific networks is associated with domain specific deficits. Our primary MEG outcome measure will be network small-worldness, calculated as the ratio of the mean clustering coefficient to the mean path length normalized to a randomly connected network (Humphries and Gurney, 2008). Secondary MEG outcome measures will include global efficiency (a measure of global integration related to path length), nodal efficiency (a measure of modularity) (Wylie et al., 2012), and degree distribution (a measure of network resilience) (Barabasi and Albert, 1999). There are minimal risks involved in the proposed research. There are no known risks from MEG recordings. In appropriately screened subjects, the primary risk of MRI is claustrophobia and anxiety which is remediable by removal from the scanner. Cognitive testing as proposed in this study may induce boredom or restlessness. Any new neuropsychiatric diagnoses detected during screening (e.g., depression) will be referred for appropriate treatment, including emergent treatment if indicated. TMS as proposed in this study has a minimal risk (less than 1 in 1,000) of inducing seizures in appropriately screened subjects or other adverse events (Rossi et al., 2009). Notably, there have no cases of epilepsy (recurrent seizures) or status epilepticus (prolonged seizure considered a medical emergency) with TMS. The risks of TMS in PD are similar to that of the general population (Vonloh et al., 2013). Transient motor worsening has been reported with supplementary motor area TMS in PD, but not with the frontal targets we have proposed. There have been reports of hearing loss with repeated TMS pulses and thus all subjects will be required to wear ear plugs, similar to MRI. There is a slight risk of headache and neck pain, which is typically self-resolving and/or treatable with over the counter analgesics. All subjects will be required to wear hearing protection and will be supervised by study personnel during all aspects of this study. A neurologist will be available either in person or on-call within the building in the event of a seizure or other adverse study events. Study personnel involved in human subject interactions will be trained not only in human subjects protection but will be also basic life support (BLS) certified and trained in seizure safety and what to do in the event of other medical emergencies. All adverse events will be reported to the IRB within 5 days and seizures or other significant adverse events associated with TMS will additionally be reported to the FDA. Individual anatomical MRI's will be obtained to localize DLPFC using Brainsight software (Brainsight, Rogue Research Inc., Montreal, Canada) for frameless stereotactic navigation (Paus, 1999). MRI scans will be acquired using a G.E. 3.0 T Signa, whole body magnet with an Excite upgrade and 8-channel head coil using a 3-D, extended dynamic range, inversion recovery SPGR ASSET parallel imaging sequence with excellent gray/white contrast. The T1-weighted series will consist of 1 mm thick coronal images to be aligned with MEG using SPM8 software (Rojas et al., 2008). Individual anatomical MRI images will be acquired and co-registered with MEG source results for location accuracy using BESA MRI software (BESA MRI 2.0; MEGIS Software GmbH, Germany). Following data acquisition, there are four major steps for graph theory analysis (de Haan et al., 2012). First, data will be transformed into the frequency domain using Morlet wavelets and parceled into six standard frequency bands: delta (1-4 Hz), theta (4-8 Hz), alpha (8-12 Hz), low beta (12-20 Hz), high beta (20-30 Hz) and gamma (30-60 Hz) (Teale et al., 2008). Further analyses will be performed separately for each band. Second, the strength of functional connectivity must be calculated among all sensors. Granger causality will be used for this step, providing a directional weighted measure of connectivity suitable for graph theory (Pollonini et al., 2010; Ding et al., 2011). Third, functional connections between nodes will be used to create a network graph. This is matrix representing the directed weighted connection strengths between all sensors for each frequency band. Advantages of creating a weighted network graph include ensuring full connectedness and avoiding potentially arbitrary thresholds required for binary networks (Rubinov and Sporns, 2010). Finally, graph analyses can be performed on the network graph using the Matlab-based Brain Connectivity Toolbox (Rubinov and Sporns, 2010) and custom Matlab code. We will address our primary clinical research question by determining whether there is a significant group difference between the real and sham treated PD-MCI patients on the MDRS change following rTMS using repeated measures ANOVA. We will address our primary physiologic research question by determining whether there is a significant difference between the real and sham treated PD-MCI patients on change in MEG measures of small-worldness using repeated measures ANOVA. Secondary analyses will include determining group differences in change on measures of quality of life, domain specific neuropsychological results and durability at the 28-day post-TMS. If cognition is improved we will use regression modeling to determine if these improvements were associated in changes in small-worldness or other MEG features. With a total sample size of 50 (25 per group allowing for 5 drop-outs from original 55) we will be able to determine a between group difference of 10 points on the MDRS (assuming a standard deviation of 13 as per prior trials and an effect size 0.77) (Dujardin et al., 2006) with 80% power and 0.05 significance. This sample size is comparable to prior Parkinson's disease dementia studies. For example, a study of rivastigmine in Parkinson's disease dementia detected significant change on the MDRS with only 28 subjects (Dujardin et al., 2006). The study protocol has been approved by the Colorado Multiple Institutional Review Board (approval No. 13-2474) and will be performed in accordance with the Declaration of Helsinki. PD-MCI patients may be considered a vulnerable population due to cognitive dysfunction but are necessary to answering our research questions. We are cognizant of this issue and will carefully assess potential participant's understanding of the study, particularly of study activities and risks. If there are any concerns on the part of the investigator or potential participant, we will require that their guardian participate in the consenting process and sign an informed consent. We will also require that PD-MCI subjects give consent, or at minimum assent if fully informed consent is not possible. Our protocol and consent forms will be approved by our local institutional review board (IRB) before approaching any potential subjects. PD is the second most common neurodegenerative disease, affecting over one million Americans and dementia is the most common cause of nursing home placement in this population (Dorsey et al., 2007; Hely et al., 2008). Our understanding of the neurobiological mechanisms of cognitive dysfunction in PD is limited and we do not have efficacious treatments. This research aims to evaluate the potential for TMS to induce durable changes in PD cognitive function and connectivity. Given the burden of dementia in this population, we feel that the minimal risks involved are justified both to individual PD and PD-MCI subjects, the larger population of PD and PD-MCI patients, and to society as a whole. Recent TMS studies using published safety guidelines suggest that the risks of TMS may be even lower than previously described. Even using conservative estimates and anticipating some discomfort from prolonged sitting and cognitive testing, we argue that this research is imperative to advance this field and ultimately to provide relief to these patients and their caregivers. This research with address this significant public health issue in three major ways: 1) Identify abnormalities in cortical connectivity associated with cognitive dysfunction in PD; 2) Develop a MEG biomarker for cognitive dysfunction in PD; and 3) Evaluate the potential for TMS to induce durable changes in PD cognitive function and connectivity. Prior TMS trials are often questioned regarding the adequacy of patient blinding with certain sham procedures. Our sham involves both auditory and tactile stimulation, and in fact resulted in a similar improvement in depression as real TMS in our recent trial (Triggs et al., 2010). Subject retention, particularly with PD-MCI, may be difficult with 2 weeks of daily treatment. We will use similar procedures to our PD apathy rTMS trial where we maintained 100% retention. Finally, our sample size is relatively small to detect clinically significant changes. This is in part due to budgetary imitations and one goal of this trial is to serve to develop a more definitive, larger trial with longer-term follow-up. Changes in sensor location over repeated recordings may result in false attribution of brain activity changes. To address this issue, sensors will be realigned to a common sensor array to allow repeated group level analysis in a shared brain space (Ross et al., 2011). At the time of the submission of this manuscript, approximately 90% of the patients had been recruited. Aydin-Abidin S, Trippe J, Funke K, Eysel UT, Benali A (2008) High- and low-frequency repetitive transcranial magnetic stimulation differentially activates c-Fos and zif268 protein expression in the rat brain. Experimental Brain Research 188:249-261. Barabasi AL, Albert R (1999) Emergence of scaling in random networks. Science 286:509-512. Barr MS, Farzan F, Rusjan PM, Chen R, Fitzgerald PB, Daskalakis ZJ (2009) Potentiation of gamma oscillatory activity through repetitive transcranial magnetic stimulation of the dorsolateral prefrontal cortex. Neuropsychopharmacology 34:2359-2367. Benton AL, Varney NR, Hamsher KD (1978) Visuospatial judgment. A clinical test. Arch Neurol 35:364-367. Boggio PS, Fregni F, Bermpohl F, Mansur CG, Rosa M, Rumi DO, Barbosa ER, Odebrecht Rosa M, Pascual-Leone A, Rigonatti SP, Marcolin MA, Araujo Silva MT (2005) Effect of repetitive TMS and fluoxetine on cognitive function in patients with Parkinson′s disease and concurrent depression. Mov Disord 20:1178-1184. Bosboom JL, Stoffers D, Wolters E, Stam CJ, Berendse HW (2009) MEG resting state functional connectivity in Parkinson′s disease related dementia. J Neural Transm 116:193-202. Chen R, Udupa K (2009) Measurement and modulation of plasticity of the motor system in humans using transcranial magnetic stimulation. Motor Control 13:442-453. Cho SS, Strafella AP (2009) rTMS of the Left Dorsolateral Prefrontal Cortex Modulates Dopamine Release in the Ipsilateral Anterior Cingulate Cortex and Orbitofrontal Cortex. PLoS One 4. Connolly KR, Helmer A, Cristancho MA, Cristancho P, O′Reardon JP (2012) Effectiveness of transcranial magnetic stimulation in clinical practice post-FDA approval in the United States: results observed with the first 100 consecutive cases of depression at an academic medical center. J Clin Psychiatry 73:e567-573. Cotelli M, Manenti R, Cappa SF, Zanetti O, Miniussi C (2008) Transcranial magnetic stimulation improves naming in Alzheimer disease patients at different stages of cognitive decline. Eur J Neurol 15:1286-1292. Daskalakis ZJ, Moller B, Christensen BK, Fitzgerald PB, Gunraj C, Chen R (2006) The effects of repetitive transcranial magnetic stimulation on cortical inhibition in healthy human subjects. Exp Brain Res 174:403-412.
de Haan W, Stam CJ, Jones BF, Zuiderwijk IM, van Dijk BW, Scheltens P (2008) Resting-state oscillatory brain dynamics in Alzheimer disease. J Clin Neurophysiol 25:187-193.
de Haan W, van der Flier WM, Koene T, Smits LL, Scheltens P, Stam CJ (2012) Disrupted modular brain dynamics reflect cognitive dysfunction in Alzheimer′s disease. Neuroimage 59:3085-3093. Delis DC, Kaplan E, Kramer JH (2001) Delis-Kaplan Executive Function System (DKEFS): Examiner′s Manual. San Antonio, TX: The Psychological Corporation. Delis DC, Kramer E, Kaplan E, Ober B (2000) California Verbal Learning Test - Version II. The Psychological Corporation, New York. Ding M, Mo J, Schroeder CE, Wen X (2011) Analyzing coherent brain networks with Granger causality. Conf Proc IEEE Eng Med Biol Soc 2011:5916-5918. Docherty MJ, Burn DJ (2010) Parkinson′s disease dementia. Curr Neurol Neurosci Rep 10:292-298. Dorsey ER, Constantinescu R, Thompson JP, Biglan KM, Holloway RG, Kieburtz K, Marshall FJ, Ravina BM, Schifitto G, Siderowf A, Tanner CM (2007) Projected number of people with Parkinson disease in the most populous nations, 2005 through 2030. Neurology 68:384-386. Dujardin K, Devos D, Duhem S, Destee A, Marie RM, Durif F, Lacomblez L, Touchon J, Pollak P, Pere JJ (2006) Utility of the Mattis dementia rating scale to assess the efficacy of rivastigmine in dementia associated with Parkinson′s disease. J Neurol 253:1154-1159. Emre M, Aarsland D, Albanese A, Byrne EJ, Deuschl G, De Deyn PP, Durif F, Kulisevsky J, van Laar T, Lees A, Poewe W, Robillard A, Rosa MM, Wolters E, Quarg P, Tekin S, Lane R (2004) Rivastigmine for dementia associated with Parkinson′s disease. N Engl J Med 351:2509-2518. Fahn S, Elton R, Members of the updrs Development Committee (1987) Unified Parkinson′s Disease Rating Scale. In: Recent Developments in Parkinson′s Disease, Vol 2 (Fahn S, Marsden CD, Calne DB, Goldstein M, eds) Florham Park, NJ. Macmillan Health Care Information. Fox MD, Halko MA, Eldaief MC, Pascual-Leone A (2012) Measuring and manipulating brain connectivity with resting state functional connectivity magnetic resonance imaging (fcMRI) and transcranial magnetic stimulation (TMS). Neuroimage 62:2232-2243. Friederici AD (2011) The brain basis of language processing: from structure to function. Physiol Rev 91:1357-1392. Hardmeier M, Schoonheim MM, Geurts JJ, Hillebrand A, Polman CH, Barkhof F, Stam CJ (2012) Cognitive dysfunction in early multiple sclerosis: altered centrality derived from resting-state functional connectivity using magneto-encephalography. PLoS One 7:e42087. He H, Sui J, Yu Q, Turner JA, Ho BC, Sponheim SR, Manoach DS, Clark VP, Calhoun VD (2012) Altered small-world brain networks in schizophrenia patients during working memory performance. PLoS One 7:e38195. Hely MA, Reid WG, Adena MA, Halliday GM, Morris JG (2008) The Sydney multicenter study of Parkinson′s disease: the inevitability of dementia at 20 years. Mov Disord 23:837-844. Hughes AJ, Daniel SE, Kilford L, Lees AJ (1992) Accuracy of clinical diagnosis of idiopathic Parkinson′s disease: a clinico-pathological study of 100 cases. J Neurol Neurosurg Psychiatry 55:181-184. Humphries MD, Gurney K (2008) Network ′Small-World-Ness′: A Quantitative Method for Determining Canonical Network Equivalence. PLoS One 3:e0002051. Jung TP, Makeig S, Humphries C, Lee TW, McKeown MJ, Iragui V, Sejnowski TJ (2000) Removing electroencephalographic artifacts by blind source separation. Psychophysiology 37:163-178. Kim SH, Han HJ, Ahn HM, Kim SA, Kim SE (2012) Effects of five daily high-frequency rTMS on Stroop task performance in aging individuals. Neurosci Res 74:256-260. Kluger BM, Foote KD, Jacobson CE, Okun MS (2011) Lessons learned from a large single center cohort of patients referred for DBS management. Parkinsonism Relat Disord 17:236-239. Lefaucheur JP (2005) Motor cortex dysfunction revealed by cortical excitability studies in Parkinson′s disease: influence of antiparkinsonian treatment and cortical stimulation. Clin Neurophysiol 116:244-253. Litvan I, Goldman JG, Troster AI, Schmand BA, Weintraub D, Petersen RC, Mollenhauer B, Adler CH, Marder K, Williams-Gray CH, Aarsland D, Kulisevsky J, Rodriguez-Oroz MC, Burn DJ, Barker RA, Emre M (2012) Diagnostic criteria for mild cognitive impairment in Parkinson′s disease: Movement Disorder Society Task Force guidelines. Mov Disord 27:349-356. Llebaria G, Pagonabarraga J, Kulisevsky J, Garcia-Sanchez C, Pascual-Sedano B, Gironell A, Martinez-Corral M (2008) Cut-off score of the Mattis Dementia Rating Scale for screening dementia in Parkinson′s disease. Mov Disord 23:1546-1550. Mattis S (2002) Dementis Rating Scale-2 (DRS-2). Lutz, FL: Psychological Assessment Resources Inc.
Paus T (1999) Imaging the brain before, during, and after transcranial magnetic stimulation. Neuropsychologia 37:219-224. Pogosyan A, Yoshida F, Chen CC, Martinez-Torres I, Foltynie T, Limousin P, Zrinzo L, Hariz MI, Brown P (2010) Parkinsonian impairment correlates with spatially extensive subthalamic oscillatory synchronization. Neuroscience 171:245-257. Pollonini L, Patidar U, Situ N, Rezaie R, Papanicolaou AC, Zouridakis G (2010) Functional connectivity networks in the autistic and healthy brain assessed using Granger causality. Conf Proc IEEE Eng Med Biol Soc 2010:1730-1733. Rabey JM, Dobronevsky E, Aichenbaum S, Gonen O, Marton RG, Khaigrekht M (2013) Repetitive transcranial magnetic stimulation combined with cognitive training is a safe and effective modality for the treatment of Alzheimer′s disease: a randomized, double-blind study. J Neural Transm 120:813-819. Robinson SE, Mandell AJ, Coppola R (2012) Spatiotemporal imaging of complexity. Front Comput Neurosci 6:101. Rojas DC, Maharajh K, Teale P, Rogers SJ (2008) Reduced neural synchronization of gamma-band MEG oscillations in first-degree relatives of children with autism. BMC Psychiatry 8:66. Ross B, Charron RE, Jamali S (2011) Realignment of magnetoencephalographic data for group analysis in the sensor domain. J Clin Neurophysiol 28:190-201. Rossi S, Hallett M, Rossini PM, Pascual-Leone A (2009) Safety, ethical considerations, and application guidelines for the use of transcranial magnetic stimulation in clinical practice and research. Clin Neurophysiol 120:2008-2039. Rubinov M, Sporns O (2010) Complex network measures of brain connectivity: uses and interpretations. Neuroimage 52:1059-1069. Sanz-Arigita EJ, Schoonheim MM, Damoiseaux JS, Rombouts SA, Maris E, Barkhof F, Scheltens P, Stam CJ (2010) Loss of ′small-world′ networks in Alzheimer′s disease: graph analysis of fMRI resting-state functional connectivity. PLoS One 5:e13788. Schretlen D (1997) Brief Test of Attention Professional Manual. Odessa, FL: Psychological Assessment Resources. Shafi MM, Brandon Westover M, Oberman L, Cash SS, Pascual-Leone A (2014) Modulation of EEG functional connectivity networks in subjects undergoing repetitive transcranial magnetic stimulation. Brain Topogr 27:172-191. Sole-Padulles C, Bartres-Faz D, Junque C, Clemente IC, Molinuevo JL, Bargallo N, Sanchez-Aldeguer J, Bosch B, Falcon C, Valls-Sole J (2006) Repetitive transcranial magnetic stimulation effects on brain function and cognition among elders with memory dysfunction. A randomized sham-controlled study. Cereb Cortex 16:1487-1493. Srovnalova H, Marecek R, Rektorova I (2011) The role of the inferior frontal gyri in cognitive processing of patients with Parkinson′s disease: a pilot rTMS study. Mov Disord 26:1545-1548. Stam CJ, van Straaten EC (2012) The organization of physiological brain networks. Clin Neurophysiol 123:1067-1087. Teale P, Collins D, Maharajh K, Rojas DC, Kronberg E, Reite M (2008) Cortical source estimates of gamma band amplitude and phase are different in schizophrenia. Neuroimage 42:1481-1489. Triggs WJ, Ricciuti N, Ward HE, Cheng J, Bowers D, Goodman WK, Kluger BM, Nadeau SE (2010) Right and left dorsolateral pre-frontal rTMS treatment of refractory depression: a randomized, sham-controlled trial. Psychiatry Res 178:467-474. Vonloh M, Chen R, Kluger B (2013) Safety of transcranial magnetic stimulation in Parkinson′s disease: a review of the literature. Parkinsonism Relat Disord 19:573-585. Wang HY, Crupi D, Liu JJ, Stucky A, Cruciata G, Di Rocco A, Friedman E, Quartarone A, Ghilardi MF (2011) Repetitive Transcranial Magnetic Stimulation Enhances BDNF-TrkB Signaling in Both Brain and Lymphocyte. Journal of Neuroscience 31:11044-11054. Wu T, Wang L, Chen Y, Zhao C, Li K, Chan P (2009) Changes of functional connectivity of the motor network in the resting state in Parkinson′s disease. Neurosci Lett 460:6-10. Wylie KP, Rojas DC, Tanabe J, Martin LF, Tregellas JR (2012) Nicotine increases brain functional network efficiency. Neuroimage 63:73-80. BMK wrote the funding proposal for this study. IB and CSM coordinated the recruitment of participants and data collection during the study. IB and BMK supervised the progress of the study. IB and CSM contributed in the manuscript preparation. All authors approved the final version of the paper.